Increased competition and low interest rates nudge market share closer to normal levels. 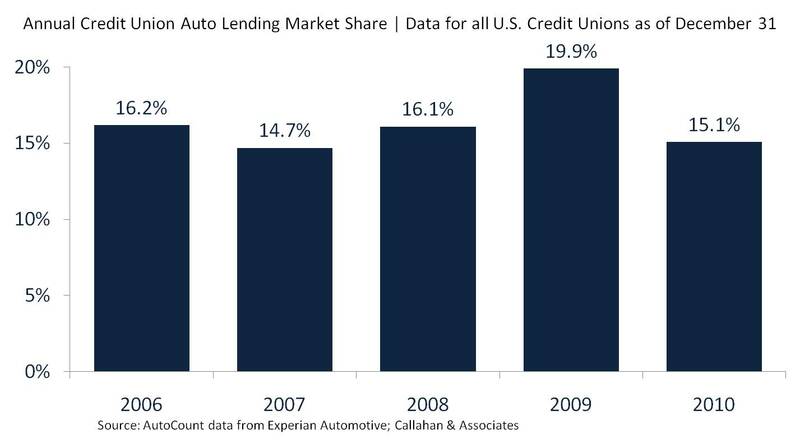 Credit unions’ auto market share reached a record high of 19.9% in 2009. That year, credit unions granted auto loans despite a difficult economy and filled the void created by fleeing captive financers. During the recovery, however, captives and banks that had reduced lending during the Great Recession returned to the market, increasing credit availability in 2010 and nudging market share closer to a more normal level of 15.1%. Auto loan balances at credit unions also declined in 2010, even as vehicle sales increased 11.1%. As near-historic-low interest rates, zero percent financing, and returning cash incentives was increasing competition in 2010 for new auto loans, credit unions were expanding their used auto lending. Used auto loan balances increased 3.4% annually; however, this was not enough to offset the 16.5% dip in new auto loan balances. Ultimately, total auto loan balances at credit unions declined 5.3% during 2010. Bucking the overall trend for 2010, credit union auto loan growth showed signs of recovery in the fourth quarter. The annual growth rate improved to -5.3%, from third quarter’s -6.0%, and the 16.5% drop in new auto balances in 2010 was not as steep as September’s 17.0% annual decline. Competition in auto lending is likely to remain intense in 2011. As consumer confidence and new vehicle sales continue to increase, credit unions will have the opportunity to capture a portion of these sales. Stressing credit union value to dealers and members, especially when it comes to helping members through the buying process, is one way to do this. In our experience we are seeing strong desire in lending from our CU partners as they have navigated indirect delinquencies and have record liquidity. However, while we are seeing some tiny movement towards taking another look from a risk perspective at "B" paper most want to lend in the prime and super prime credit traunch. Difficult considering (as you noted above) manufactures are back as are large Bank auto lenders (Chase and Wells).